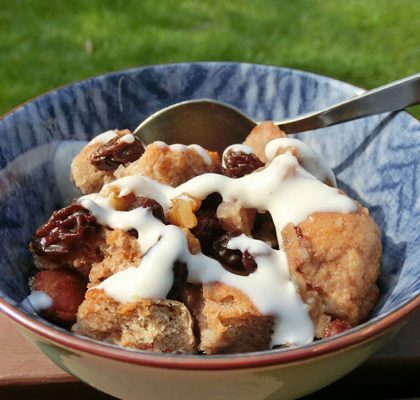 If you happen to have some stale bread left over this is a great way to use it up. Endlessly adaptable you can change the type of bread and toppings to suit whatever you have available. Cut the hot dog bun into small cubes and arrange in an oven-proof dish. Roughly chop the almonds and sprinkle with the raisins over the bread. In a separate bowl mix the soy milk, coco quench, potato starch and spice. Once you’re sure the starch is mixed in well, pour over the bread. Bake in the oven at 180℃ for 25 minutes. You can adapt this recipe easily by replacing either of the milks with any you prefer such as rice or almond milk. You can also change the toppings, adding fresh fruit or bananas and chocolate or whatever you fancy. The choice is yours!